An affordable set of snow tires can save you a lot of headache. We'll just say it now. If you live in an area where you get real amounts of snow that stifle traffic and impede safety, all-season tires won't cut it. All-season tires are actually a lousy compromise between summer and winter tires. They don't excel in either situation, and they're essentially like wearing a pair of casual sneakers for every occasion. Of course, buying all-seasons saves you money, but they're actually less safe in winter than snow tires. And now that the temps in many areas have already dropped below freezing, it's the perfect time to swap out tire sets before the snow starts to fall. Rather than all-season tires, you should really consider that there are two separate seasons when it comes to tires, summer and winter. Both have strengths in the season for which they're designed, and those strengths become weaknesses when used in the wrong season. Summer tires typically go from March/April through October. Of course, that depends on where you live. But those are good rules of thumb to follow. Let's take a look at some other factors that come into play for winter tires. Summer and winter tires differ from each other in terms of construction, tread pattern, and rubber compounds. Of course, most folks can't tell the difference just by looking. It's important to understand the makeup of a winter tire first in order to understand the difference. Winter tires need to stay soft and flexible in order to provide ideal grip rather than become rigid when temps drop the way summer tires do. 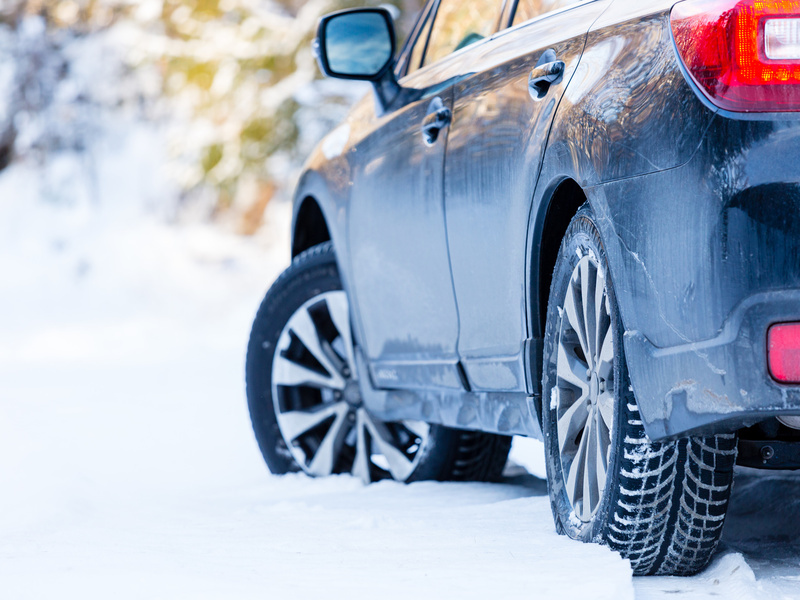 Even all-season tires aren't nearly as flexible as winter tires because when temps rise, the tire would become too soft, and tread life would decrease substantially. Winter tires are made with a softer compound that involves a higher percentage of rubber for flexibility. It also includes silica that acts like grippy sand and bites into the slick stuff. Think of how a winter boot bends and flexes in accordance with the snow, and you pretty much get the idea. Summer and all-season tires can't do the same thing. The diagram of tread patterns above (image: Les Schwab) shows a huge difference between winter tires and all-season tires. The winter tires have a more aggressive tread pattern that's meant to increase bite/grip, and also rain/snow/slush dispersion. The outer shoulders of the tire have bite blocks that clamp down on ice and snow, whereas the summer tire shoulders are rounded. Winter tires also have something called sipes, which you'd never notice unless you got close. These are the thousands of little cut lines in the tread that help bite down on slippery snow. Even as the tread wears down, many winter tires have teeth in the sipes that still bite down when tread gets shallow. There are also wider grooves and channels to disperse slush and water, good for pushing the wet/frozen stuff out of the path of the tire instead of riding on top of it. Conventional wisdom says that metal studs in your tires are the best for traction, but tire compound an construction have changed so much that this isn't always the case. Plus, if you drive on studded tires, you can damage the road surface while also compromising dry handling. Dedicated studless ice and snow tires have a number of advantages including utilizing the latest in tire technology to maximize traction. Of course, some high-speed driving capability and handling are given up in the name of grip. Unless you live in the far northern climes where snow and ice are on the ground constantly, stick with studless. Then there are winter performance tires that are very good in snow and ice but give up some traction in the name of handling and high-speed driving. These are typically dedicated for sports cars and sporty sedans and come in low profile sizes. But keep in mind that some safety is given up because they don't do as well in ice and snow as dedicated winter tires. Some folks think it's okay to just buy two winter tires for the wheels that are driven (front or rear) versus spending the money for all four. That would be a bad move that actually compromises safety. If you have mismatched tires, the car will handle unpredictably and that much worse in emergency handling and braking situations. You will definitely put you and your passengers in danger just to save a couple of hundred dollars. If you buy a full set of winter tires on steel wheels (much more affordable) and change out your summer tires at the right time, they will last you years. Just make sure not to drive on winter tires past the spring as the soft compound will break down and ruin the life (and safety) of your winter tires.